Since today is International Women's Day, I thought I'd take a look at Project Gutenberg for a short story by a woman to review. 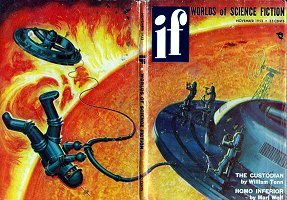 There are a number of science fiction publications available on the site now. Many stories written for these magazines were by women, including Marion Zimmer Bradley. I looked at a few but the title of this one caught my eye and I had to read it. It's I'll Kill You Tomorrow by Helen Huber. A nurse in a maternity ward notices an unusual silence among the newborns. She picks up one to cuddle and he tries to put his tiny baby hands around her neck to strangle her. She's even more startled when he speaks. "Careful you fool! You'll drop this body." A thin piping voice. A shrill symphony in malevolence. "...These hands are too fragile. There are no muscles in the arms. I couldn't have killed you." "It would be nice to kill you. Someday I will. Someday I'll kill you if I can find you." These aren't normal babies. They're "bodyless entities" bent on human destruction. This entity is real excited to have found 30 bodies to inhabit. Unfortunately, they are babies and can't do much destroying yet. I was totally reading this baby's dialogue in the voice of Stewie Griffin. Another baby with a taste for murder. The nurse freaks out and runs to her doctor boyfriend (of course she has a doctor boyfriend). They make out a little first. Lorry came close. "Kiss me. Kiss me—hard." Pete kissed her, then held her away. "You're trembling. Anticipation, pet?" He looked into her face and the grin faded. "Lorry, what is it?" "Pete—Pete. I'm crazy. I've gone mad. Hold me." He could have laughed, but he had looked closely into her eyes and he was a doctor. He didn't laugh. "Tell me. Just stand here. I'll hang onto you and you tell me." He doesn't assume she's broken into the medical marijuana, though he wants to see it for himself. The baby doesn't pull a Michigan J Frog. Instead shares his scheme with the doctor too. Loose lips sink ships, baby monster! Lorry and Pete know they must save humanity. Pete does the thinking for the both of them and gives her a "I'll take care of this, babydoll" (paraphrasing). "It took courage. Tell me: why are you so strong, so brave? Why are you so wonderful?" Then they make out some more. It's a dopey story, but I actually liked it! It was unintentionally hilarious and so of its era (1953). There is so much talk of women in sci-fi lately, that I think it's important to point out that women have been writing in the genre for a long time. I can't find much on Helen Huber, other than that's she's included in science fiction anthologies like Women Resurrected, and Partners in Wonder. I'm unsure if she's the same Helen Huber who co-wrote a home health aide's guide and was a DJ. The obituary of that Helen says she was a gifted writer but doesn't mention I'll Kill You Tomorrow. Happy International Women's Day, friends!